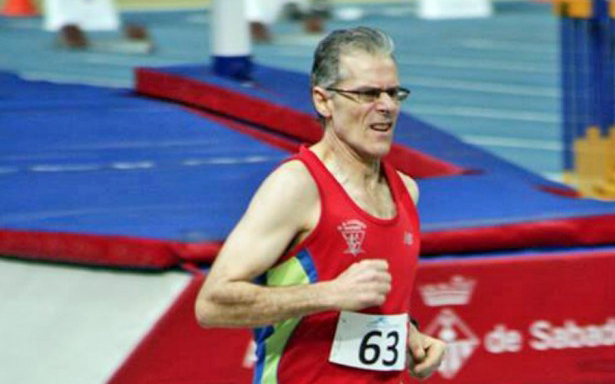 Joaquín Joyas likes to set records at Sabadell, Spain, with the latest being a sizzling 2:13.87 at age 60. At the start of last weekend, Horace Grant held world indoor 800 records in M55 and M60. Today he has none. Joe Gough of Ireland claimed the M60 Sunday. Now we learn that the M55 record fell the same day — to Joaquin Joyas Albertus. Competing against youngsters, Joaquin, who turned 55 in mid-November, ran 2:06.87 to lower Horace’s listed WR of 2:07.05 from 2010. Spanish media said Joaquín ran with three others 44 years younger than him. With Sergio Muñoz winning in 2:01.61. Also that this was his second meet since he turned 60 — and the first race was a Spanish M60 record in the 1500 (which I haven’t seen). Alan Sigmon, my statnut friend, gave me the heads up on Joaquín’s 800 via a Spanish track federation bulletin, which also reported an M45 European indoor record for 3000 meters of 8:27.71 by Driss Lakhouaja. “European federation seems to ignore or be unaware of Vyacheslav Shabunin’s 8:23.78 at Moscow on 11 Jan 15 — it’s not even listed as pending, as some other Shabunin marks are,” Alan writes. The listed M45 indoor WR is 8:26.15 by American Brad Barton in 2014. Be the first to comment on "Spaniard Joaquín Joyas sets another gem of a WR: M60 800 meters indoors in 2:13.87"